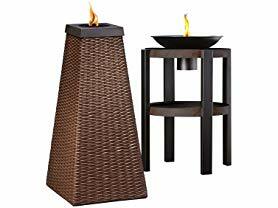 Today ONLY - TIKI Lamplight Antigua Fire Sculpture or TIKI 25-Inch Huntington Metal Patio Torch $69.99 (Retail $99.99). Create a Paradise in Your Backyard with TIKI Brand Fire Sculptures. Perfect for everyday use or the most lavish party. TIKI Brand Fire Sculptures add ambience and sophistication to your backyard, deck or patio. The Antigua Fire Sculpture features a durable, weather resistant brown variegated weave with black accents for long-lasting beauty and performance year after year. Next time you host a group or just someone special, set the mood with the TIKI Brand Huntington patio torch. It's beautiful wood-grain pattern works well with any decor &amp; the durable steel construction offers long-lasting decor to any patio.